I’m keeping an eagle eye on some trees at the moment. Hidden in the hedgerows of the fields that surround the cottage, there is a store of purplish-black gold for those who know where to look. 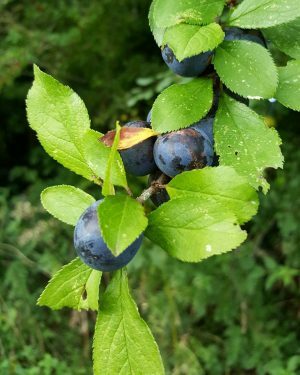 Damsons, wild plums, hide in plain sight, tucked behind the still-green leaves on wizened old trees flanked by thickets of sloe-flecked blackthorns and ripe red hawthorn. When the autumn weather is good, I pull on my wellies, grab the basket and haul / coerce the girls down the fields to forage for blackberries, horse chestnuts, sloes, crab apples and – best prize of all – those luscious, sun-warmed damsons. Some years they are so ripe and rich, that we eat at least one for each handful that goes into the basket, staining fingers a dirty purple and spitting stones out along the way home, in the hope that more of these trees will appear. There’s one particular tree down on the river bank that always has the biggest damsons. Apart from the years it has none, for even wild trees must take a break. I’ve got a fall back option, though. There’s a tree near the cottage, which even though it faces south, never quite ripens in the same way as the river tree. Picked too early, the fruit has an astringent bite that has your mouth pucker immediately and causes small girls to make the most entertainingly disgusted faces. 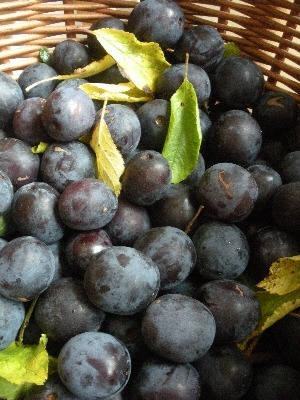 The basketful brought home, it’s best to use the dusky plums fast for wild fruit never lasts long indoors. I’ve made clafoutis and gin, crumble and jam in many guises but this, my Damson, Stout and Vanilla Jam, is the perfect way to store up those autumn flavours for brightening winter mornings. Because there’s always beer in the house, I often use it in cooking. This time round I grabbed a bottle of Knockmealdown Irish Stout from the family brewery to add extra complexity to the jam, adding some vanilla at the end to round off the flavour. There’s lots of brilliant Irish microbrewed stouts on the market – look locally for an example from your area, possibly made from the same water that fell on the damsons. Makes approximately 5 x 454g/1lb jars. Prepare the jam jars: wash jars in hot soapy water and rinse. Preheat the oven to 160°C and sterilise the jars by heating them for 10 minutes. Pour boiling water over the lids before using them to seal the filled jars. Put the damsons in a large, wide pan with the water and bring to a simmer over a medium heat for about 30 minutes until the fruit has burst. Tip in the sugar and lemon juice. Stir until the sugar has dissolved, then bring to the boil. This is when you skim off the damson stones, using a slotted spoon. If there’s a white scum on top, stir in a knob of butter in at the end of cooking time and it will disappear. Remove from the heat, stir in the amaretto, pour into hot jars and seal immediately with the hot lids. How does your garden grow…organically?